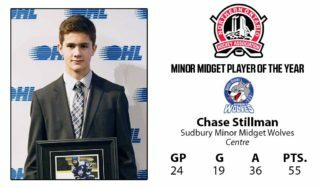 Five of the seven Player of the Year award winners are currently competing at the 2019 OHL Cup Showcase Tournament powered by Under Armour including Shane Wright of the Don Mills Flyers (GTHL), Jack Michaelis of the Thunder Bay Kings (HNO), Chase Stillman of the Sudbury Minor Midget Wolves (NOHA), Brenden Sirizzotti of the Whitby Wildcats (OMHA ETA), and Lawson Sherk of the Halton Hurricanes (OMHA SCTA). 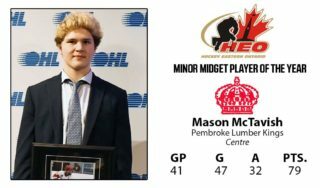 Deni Goure of the Chatham-Kent Cyclones (ALLIANCE) and Mason McTavish of the Pembroke Lumber Kings (HEO) were also recognized among the Minor Midget recipients. All seven award recipients are forwards producing impressive offensive totals throughout the regular season. Goure scored 22 goals and 31 assists for 53 points in 32 games for the Cyclones, while Wright scored 31 goals and 41 assists for 72 points in 33 games for the top ranked Flyers. 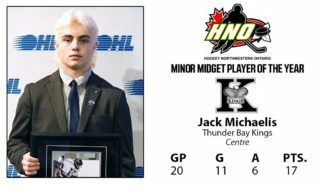 Michaelis chipped in 11 goals and six assists for 17 points in 20 games for the Kings, meanwhile McTavish tallied 47 goals and 32 assists for 79 points in 41 games for the Midget Lumber Kings, and Stillman recorded 19 goals and 36 assists for 55 points in 24 games for the Wolves. 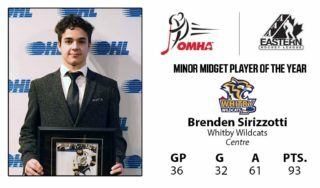 In the OMHA, Sirizzotti led all award recipients with 93 points in 36 games including 32 goals and 61 assists for the league champion Wildcats, with Sherk scoring 15 times along with 35 helpers for 50 points in 31 games for the silver medalist Hurricanes. McTavish, Stillman, and Wright were all members of Team Ontario who earned silver at the 2019 Canada Winter Games. 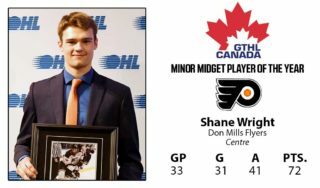 Wright, who was just recently granted exceptional player status as a 2004-born player for the 2019 OHL Priority Selection, was captain of that team. 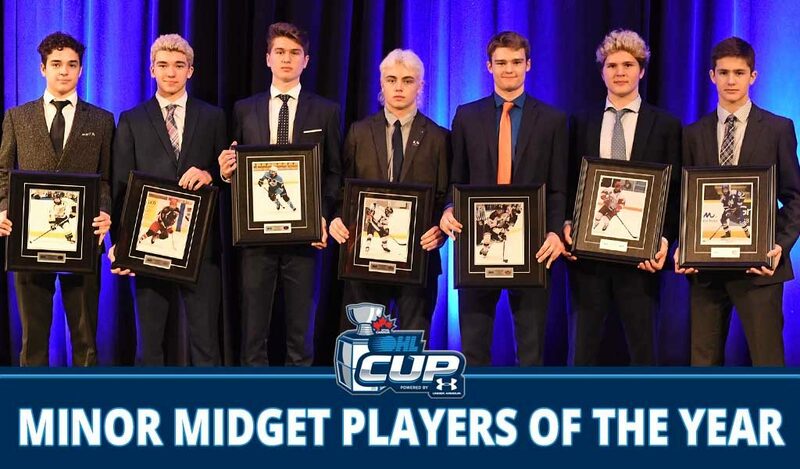 The awards were presented at the OHL Cup Showcase Tournament Banquet for the ninth straight year recognizing the achievements of the top minor midget aged players from across Ontario. The awards are presented annually to honour the minor midget players who best exemplify outstanding ability and the qualities of sportsmanship and leadership as voted by the minor hockey coaches, managers and organizations of each respective league.